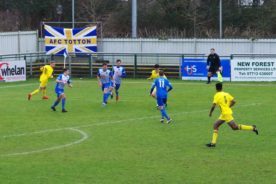 Fleet Town’s attacking play this season saw them score three goals again and still return without any points. 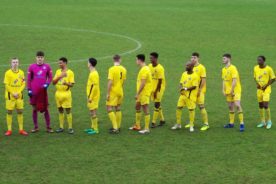 This result takes the total number of goals scored and conceded in the 24 league games played so far to 108, which is an average of four and a half goals per game, making the Fleet games the one to see if you like seeing goals. 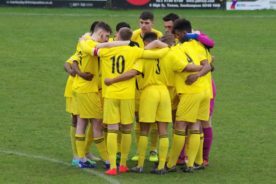 But the goals and result on the day take second place to thoughts of Billy Oram who was knocked unconscious when struck in the face by the ball late in the second half. 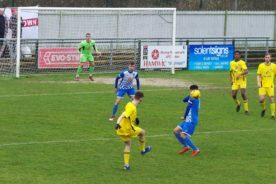 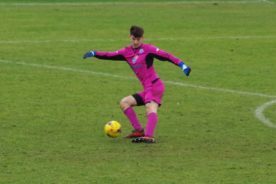 Fleet started the game brightly winning the first corner of the game in the early moments, the Totton defence scrambled the ball out, but only as far as the waiting Bradley Wilson who fired a shot back into the crowded area, bringing a save from the home keeper Max Harris. 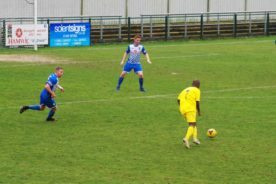 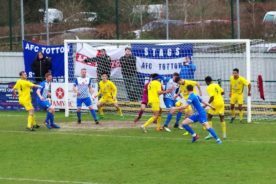 On 7 minutes Totton took the lead when Jack Masterton lobbed the ball from the edge of the area over Fleet keeper Harvey White, only three minutes later Totton doubled their lead when Stuart Green tapped in a Jason Brookes cross. 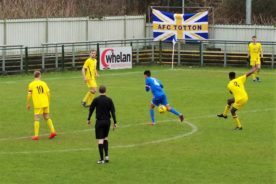 The Totton supporters thought they had scored again a couple of minutes later but this time the goal was ruled out for a foul in the box and a clearing free kick to Fleet. 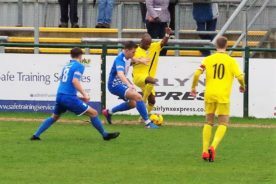 Despite these early setbacks, Fleet never stopped looking for a way back into the game, Bradley Wilson being very unlucky when his shot clipped off a defender to loop up and just clear the bar to land on the top of the net, from this corner, the ball was knocked around in the box before being laid back to the waiting Meshach Williams outside the box, his fierce shot bringing another fine save from Max Harris. 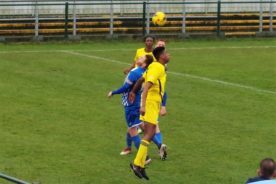 Fleet soon had another chance when Joe Wilson lifted a free kick from the left, into the middle of the box, it was met by the head of Ed Plackett, but the ball flew wide of the goal. 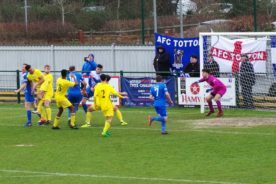 Fleet then built an attack down the right through Bradley Wilson, he drove into the box and fired the ball past Harris into the net to reduce Totton’s lead. 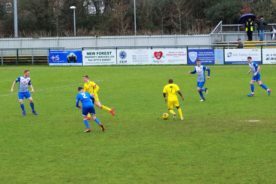 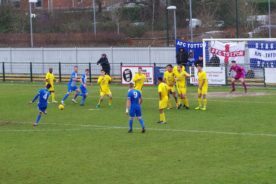 But all of Fleet’s hard work was undone straight away as Stuart Green restored Totton’s advantage within thirty seconds as he ran through the middle and found a way to get the ball past Harvey White. 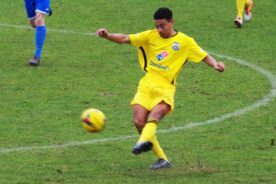 Danilo Cadete had a chance to get Fleet back into the game again, his run down the left to the box, he kept the ball and made space to curl a shot from the edge of the box, but the ball passed wide of the target. 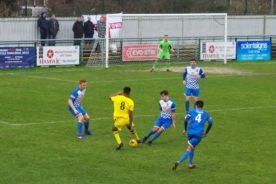 Fleet carved open another good chance when Meshach Williams cross from the right was too fast and just too far in from of Bradley Wilson to reach and tap in. 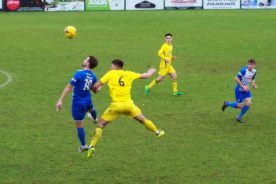 The final minute of the half saw the home side reduced to Ten players when Craig Feeney was given a straight Red Card when he appeared to tread on Ronan Silva. 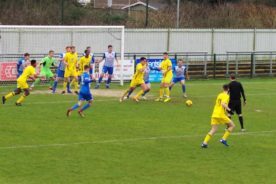 The second half started with Fleet looking to make something of their man advantage and as Meshach Williams closed in on the box he was brought down, Joe Wilson put the free kick deep into the danger area and as the Totton defence failed to clear, Sam Williams was there to stab the ball just inside the post for his first goal for Fleet Town on fifty minutes. 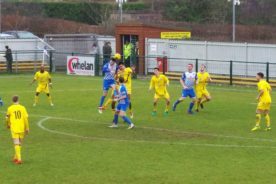 With forty minutes to play and only a goal behind the Fleet fans started to think they would still get something from the game. 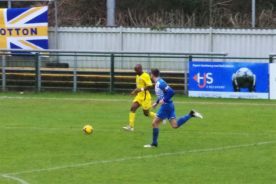 But as the wind picked up and the Rain got heavier the game swung back in favour of the home side as sub Ollie Bradley slid home a fierce cross to make the score 4-2. 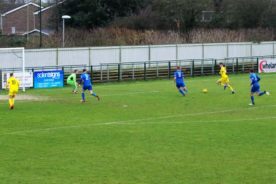 After 71 minutes, the home side made the game safe when Stuart Green completed his hat trick with s fine diving header. 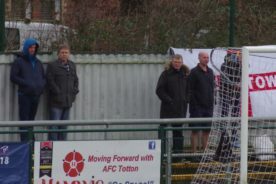 Fleet though kept pushing on, in case they could find another way back into the game and after 80 minutes as another attack was being snuffed out, the Totton clearance Billy Oram found himself in the firing line as the fierce clearance caught him full in the face from less than a yard away, he was unconscious by the time he hit the ground, the whistle blew and game stopped instantly as players gathered round, both sides physios attended to Billy to keep him stable and kept warm and dry, under umbrellas from the crowd, until he could be safely moved and carried off on a stretcher after eight minutes, but it was still a long wait in the dressing rooms before an ambulance finally arrived, by which time Billy was up and talking but has no memory of the incident. 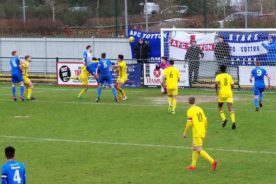 Three minutes into the added time, Bradley Wilson scored his second goal of the game to make the score 5-3 to Totton, then Fleet almost pulled another back three minutes later but keeper Max Harris was in the right place to save from Abdul Rajab. 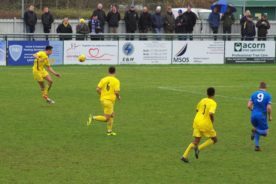 Next up for Fleet will be the visit of another of the top sides, Yate Town to Calthorpe Park on Saturday 2nd February. 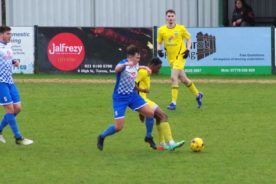 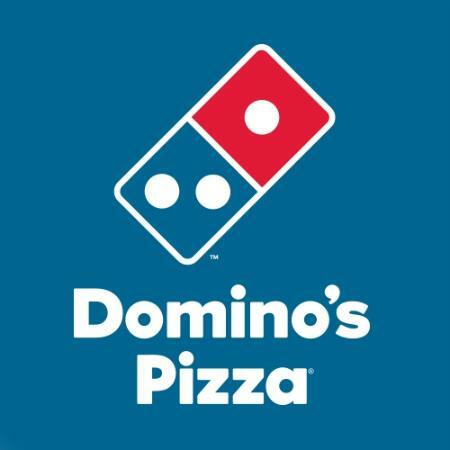 Fleet Town : 1 Harvey White, 2 Joe Wilson, 3 Callum Abraham-Barlow, 4 Sam Williams, 5 Ed Plackett, 6 Jordan Stepney, 7 Danilo Cadete, 8 Ronan Silva, 9 Meshach Williams, 10 Billy Oram, 11 Bradley Wilson.